Oct 17-21, 2009. 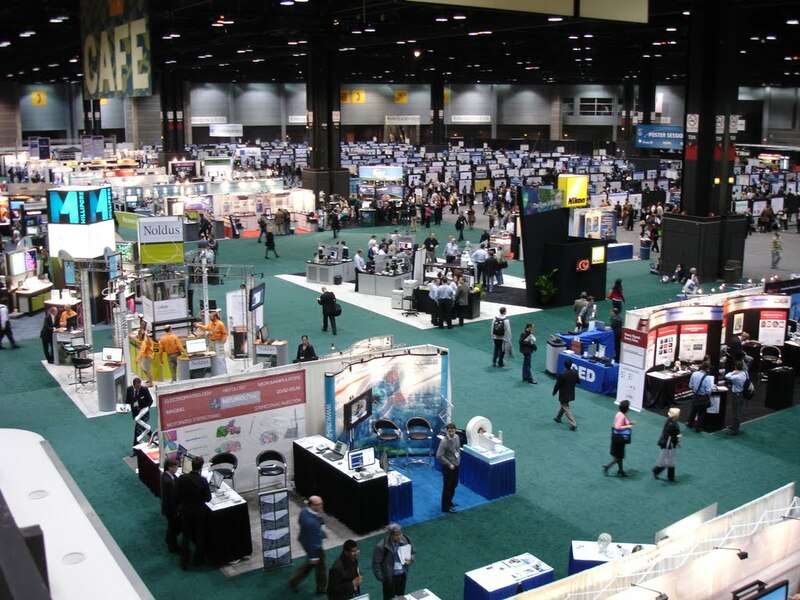 Chicago was where I attended my first society for neuroscience conference. 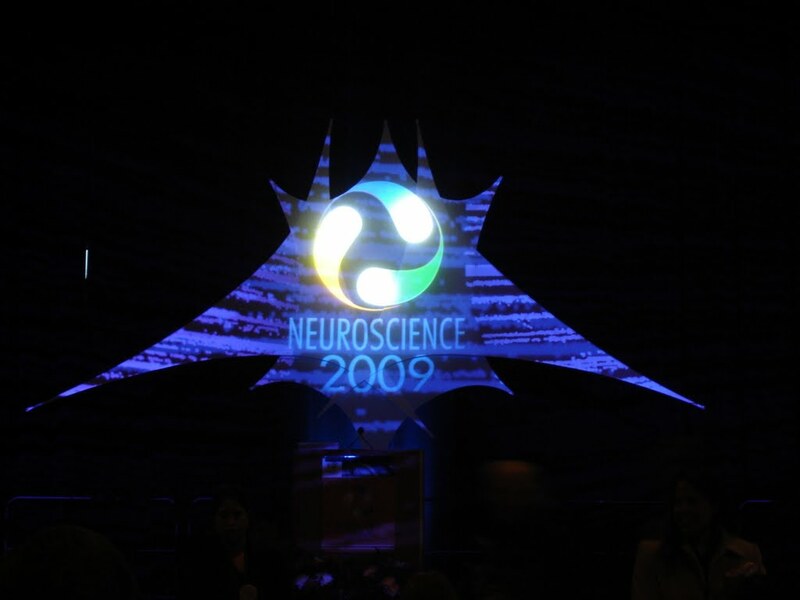 It was exciting to see over 32,000 people, all doing something related to neuroscience. It was diverse both in terms of research topics and quality of presentation. Many different kinds of people, some trying to hide their name tag, some trying to impress others, showed up. It was a great place to socialize and talk to others, although it was so big that I missed many posters and sessions that I wanted to listen to. Here’s my summary of the academic experiences. I hovered around the STDP session. I talked to Brent D. Doiron about how STDP in the dorsal cochlear nucleus (DCN) can maintain the temporal code (time to first spike) while changing the gain (threshold) . It was interesting to see how the direct excitatory input and indirect inhibitory input gives rise to compound temporal response to the fusiform cells, and as the authors claim, specific firing pattern can change this response. One of the questions I had is how the higher order brain areas can induce STDP, since the post synaptic (fusiform) cells can be directly driven by the parallel fibers as well as the auditory nerve, creating timing patterns that induces STDP on those synapse could be challenging. The presidential lecture was on abstract knowledge by Elizabeth S. Spelke. The ability of abstraction is one of the key qualities of intelligence that I would like to study in the future, so I was very excited. The talk was about studies of infants and animals using response time (RT) change when novel things are presented. Basically many animals have the ability to count small numbers up to 3 and tell the cardinality (ratio) difference of a set of objects for numbers. I was hoping she would talk how these abilities are obtained, and how they could be generalized, but perhaps I had too high expectations. I found a flavoprotein autofluorescence study in rat that showed single formant and complex formant activates different regions of the auditory cortex, and learning strengthened the response . This suggests that the auditory system is specialized for different frequency structures at least in rats. In retinal ganglion cells, the firing pattern is well described by the pairwise interaction and maximum entropy distributions (like Bialek’s group showed it in general). The poster by Andrea K. Barreiro and coworkers examined a simple model that could potentially have higher-order interaction between three neurons to see how well the theory holds [3,4,5]. Various input distributions were provided to see the deviation from pairwise maximum entropy model, and with the choice of bimodal input distribution, she could achieve significant higher-order correlation that is not explained by pairwise interactions. I thought this is of particular interest to my collaborator Sohan Seth. I had a poster presentation in the morning, but being the second author, I could still roam around. Chen presented an interesting poster of altering the population bursting activity of cultured neurons by using different ratio of inhibitory neurons (GABAnergics from striatum) and excitatory neurons (tagged and selected) . They showed that when more inhibitory neurons are added, the burst structure enlongates, and become less periodic. 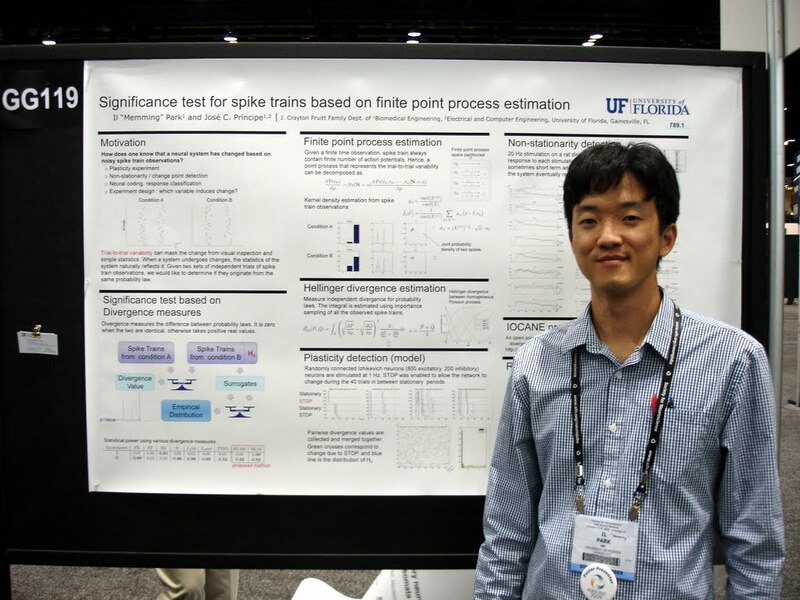 Mark Humphries‘s poster on a new spike train clustering algorithm was very related to my research about spike train spaces in collaboration with Antonio Paiva . Basically, he was applying the community finding algorithm by Newman  to the normalized spike train similarity measures, and using a heuristic he could find how many clusters should be found. I was looking for some unsupervised learning work, and I found a poster on a computational model for unsupervised/supervised learning in the visual hierarchy, presented by Luis Bettencourt . Using unsupervised Hebbian learning with feed-forward neural network comprised of S and C cells (simple and complex? ), they investigated the number of images required for the classifier. I’d like to see extensions of the unsupervised part to spatio-temporal patterns. In human learning nanosymposium, I was inspired by a talk by Pavao on online learning abstract concepts from examples . They presented same class examples and different class examples and measured how well they learned. Each presentation of a pair is designed to provide one bit of information, because they would be different by a single feature. Interestingly, the subjects learned better from different class examples. Of course, in my mind I came up with another variant of Eleksius where the god presents such examples continuously. I had my poster and a flight to catch, so I had to miss a lot the last day. I’d like to thank all the people that visited my poster. I’ve never had such a big crowd. If you find any errors in this post, please let me know. Memming thanks the office of research and graduate studies and J. C. Pruitt family department of biomedical engineering for the partial support of his travel.